at The Watching You Awards! 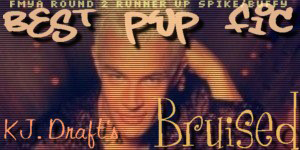 "Best UC Fic" at The Fancy Me Yours Awards! 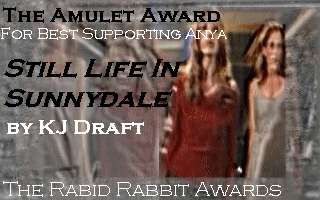 Still Life In Sunnydale nominated for "Best Dark Series"
at The Precious Illusion Awards! 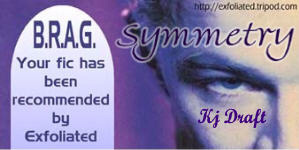 Symmetry nominated for "Best Angst" and "R&T"
at The Immortal Moonlight Awards! Faded Eyeliner nominated for "Best Slash"
at The Shades of Grey Awards! 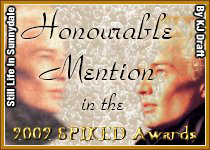 Still Life In Sunnydale nominated for "Best Dark Spike Fic: Long"
Faded Eyeliner nominated for "Best Buffy/Faith Fic"
"Best Romance" at The Bite Me Awards! Tooth and Nail nominated for "Looks Like We Missed the Bed Again"